Through my work with the Lake Baringo Biodiversity Conservation Group and growing up in the region, I have directly witnessed the decline and endangerment of the African Fish Eagle. This spectacular bird that feeds on fish is being poisoned by farmers and agricultural uses. We at Lake Baringo Biodiversity Conservation Group were concerned about information received about a decline in the population of Fish Eagles for no clear reason and a huge increase in the water level in the lake. 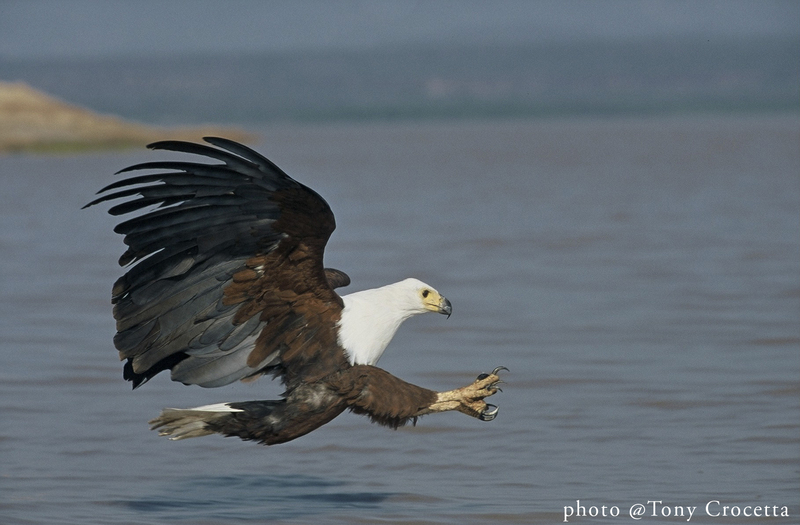 Whether this water level increase was good or bad for the general welfare of this vital wetland ecosystem, is a question that we cannot answer with precision without seeking the opinion of a biologist and receiving data to support our hypothesis .The researchers suggest that the decline of the Fish Eagle population in Lake Baringo is being driven by poisoning. Munir Virani, who is director of Peregrine funds Africa programmes, has been carrying out research in this area, and has blamed this decline in the use of Furadan by farmers to poison crocodiles. Farmers occasionally lace the bodies of dead fish with a toxic pesticide called Furadan. This appears to be aimed at crocodiles that kill their livestock. Farmers use the fish to entice crocodiles into their death, however, not all poisonous fish are eaten by crocodiles, and some end up being eaten by Fish Eagles. If this is done rampantly it can easily wipe out the whole Fish Eagle population in Lake Baringo. Additionally, the Fish Eagles in Lake Baringo have been trained to be eating dead fish by the local boat operators. They did this deliberately to allow tourists to have a closer view of this spectacular raptor picking up the fish. However, with farmers putting dead poisonous fish into the lake, Fish Eagles trained to eat dead fish subsequently consume these as well. Although the practice of enticing Fish Eagles with dead fish for tourism purposes has no direct detrimental effects on the species, due to the farmer’s practices this has become a serious concern. Unfortunately, no government institution mandated to protect wildlife has intervened to halt the practice of releasing dead poisonous fish into the lake. Many members of LBBCG run boat excursion businesses for tourists, and have been trying to educate their clients of the risk that such practices pose to these birds of prey. We have subsequently, written to Nature Kenya and Kenya Wildlife Service informing them of the urgent need of an appropriate intervention. Furadan, an insecticide, is an extremely toxic to mammals (including Humans! ), invertebrates, fish and birds. The plight of the African Fish Eagle and other wetland birds is being documented by Stop Wildlife Poisoning and WildLifeDirect. In 2009, Dr. Richard Leakey at WildLifeDirect addressed the potential ban of Furadan in Kenya and FMC’s (Furadan manufacturer) withdrawal from the Kenyan market and its buy-back programme following the poisoning of lions in the Maasai Mara. Although in a follow-up article, the legality of the toxic insecticide in Kenya was still up for debate, and the death of wetland birds in Bunyala due to Furadan poisoning is still being observed in 2011. Stop Wildlife Poisoning has geared up its awareness campaign and regularly posts about the use of pesticides in Kenya and the poisoning of birds due to Furadan. A video was produced for International Vulture Awareness day on September 2, 2011, and many other images and videos regarding the poisoning of Kenya’s birds can be viewed on Stop Widlife Poisoning’s website. This disturbing and unacceptable use of pesticides needs to be addressed by the Government of Kenya and its East African neighbours. A terrible situation, thank you for highlighting it. Thanks! I just think that someone somewhere has to tell about it before it is too late!! Otherwise we may see this great bird decline more, you never know. better to be cautious.. I have so enjoyed watching the African fish eagles during my time at Lake Awassa. Thanks for this post. You’re welcome, glad you enjoyed it and the African Fish Eagles at Lake Awassa!